Now, I'm a Mac guy all the way- my family has loved and used Mac computers since before I was born- and while they're far from a perfect company, the innovation and the quality of the machines makes me stand and applaud... most of the time. 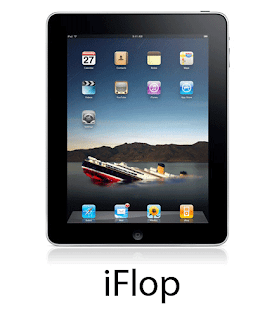 I can't help but feel pessimistic about the iPad. Let's be honest- most Mac users already have a Mac laptop that they carry everywhere... I just can't believe that people need another device (and one that appears so cumbersome). It's too big to be really portable, too small to do any serious work. Try writing a paper or an article on that thing- no go. Sure, there are times when an iPhone is too small and a laptop is too big- but those times aren't worth $500. I already feel like having an iPod touch as well as a laptop is kind of superfluous... and Apple is telling people with an iPhone and a MacBook to get an iPad too? I can just see the guy in Starbucks, putting his iPhone in his pocket and nudging aside his MacBook in his messenger bag to pull out his iPad, just to do something he could have done just as easily on either machine. This is the model Steve Jobs put forth: three devices- I can't think of this as anything but absurd. Still, Apple may see greater sales from those who don't own an iPhone/iPod or a Mac laptop, and want a way to access the internet, movies, music, etc. on the go. To me, this purchase would make sense: If you want to pay $500 to surf the web and play games on the go, good for you, really. The problem is with the urge to Mac owners to use three mobile devices... it seems obscene to me. I don't think Americans have that kind of money to throw around right now. Furthermore, I don't think Americans should be spending that kind of money. We spend far too much on things we don't need already- to be honest, who needs an iPod? We are hard pressed to justify so many of our purchases, especially when it comes to gadgets that we think are necessary that really aren't. Given this, why would we go out and spend more money on a device that offers essentially nothing new to the customer? I think Americans will see these problems with the iPad...and while I think the iPad will sell, I don't think it will go as far as Apple hopes. I must admit, though, they look very cool, and in spite of myself, I think it would be a lot of fun. But come on: in reality, the only difference between the iPad and an iPod is one letter. That's not worth $500. Ginsberg, Kerouac, and all that Jazz. The connection between the beat writers and Jazz has always interested me- inasmuch as I enjoy Kerouac and Ginsberg, I cannot bring myself to believe that the beat poets quite understood Jazz. I’m sure they listened to the music and were far more familiar with it than I could ever hope to be, but I feel they missed something essential about Jazz- the beauty and goodness of it, to be blunt. The reckless improvisation that is freedom to Miles Davis is despair to Ginsberg. All throughout Howl, the images of Jazz and of Harlem read like some popular reimagining of the Inferno- suffering, torment, emptiness, the absence of God. Still, I think it is fair to say that Kerouac got his attempt a little better- I think his improvisation works much better than Ginsberg’s precisely because it is prose, not poetry: Kerouac is always forced to keep his wandering in check and come back to the narrative. However disjointed he is, and however frustrating and wearisome this eventually becomes, he comes a little closer to success than Ginsberg. In all my wrestling with free verse, I have come to believe that most free verse poets are often better suited to narrative prose than to poetry. The best free verse poets are focused enough to keep their poetry unified, and of course, should keep on writing poetry. But I think a good many mediocre free-verse poets could make good novelists, if they could make the switch. What were we talking about? Oh, yeah: Jazz! In the end, the beat poets fail to capture the style of Jazz in writing. Read Howl (which is an amazing poem, just amazingly evil) and then listen to Charlie Parker and Miles Davis for an hour. The beat poets cannot compare. They wear Jazz’s “ghostly clothes”, while Coltrane and the rest are clothed in its robes of splendor. Rafael Chavira and I have embarked on a journey to review fast food joints... so check out our blog! Oh, yeah: and you may gather that, from the fact that we ate Chinese food, I'm off the Daniel Fast- I decided to ease my way into it, and go the full 21 days once I get back to Biola. Oh wow... Interterm is almost over... I NEED TO GO READ ARISTOTLE!!! So, depending on how you look at things, I have already broken my New Years Resolution. If, by “posting at least every week”, I meant posting every 7 days… then I have obviously failed. If by “posting at least every week”, I meant posting at least once in every 7 day period (from Sunday to Saturday), then I still have a chance to make this work…barely. Well, the point is, I’m fasting. Daniel abstained from all food other than vegetables at least twice. The point of fasting, as a good friend reminded me, is to remove something from your life, and allow God to fill it. Otherwise, there’s no point to it. In all seriousness, though, I’m looking forward to the rest of this fast. I’ve reconciled with tofu, and I’ve developed a new appreciation for the state of Idaho and all their potato farms, but I hope to gain far more than this. I hope that through this experience, I will indeed learn to follow in the footsteps of Daniel, and others, saints and prophets both famous and unknown, who so loved God that they neglected other, lesser goods in order to better know and love He who alone is Good. It's been one year since I started this blog... And I have sadly neglected it. I've never been much for resolutions- but I think the sorry state of my writing demands some sort of action. I have chosen to pursue an education in English writing- which leads me to believe that I should probably spend more time writing. This has been a dry year for me as a writer, unless you count term papers. I therefore propose to post on this blog at least every week- which is not really all that significant, but I think I'll start with that, and hopefully step it up from there. Once again, Happy New Year everybody!